The stock market has been up all the way since the beginning of the year. Despite the economic woes of the average citizen, our stock market seems to be racing all the way to the top. We’ve already addressed questions as to whether the stock market is overvalued quite a few times on this blog. But we’ve never discussed the hidden accelerator that can drive the market all the way up – or down. We’re talking about stock market leverage. As we all know, leverage is an amplifier. When things are good it’s great, but when things are bad it’s worse. Leverage in the stock market can be gauged by a figure known as margin debt, which is debt a brokerage customer takes on when doing margin trading. The NYSE tracks this figure monthly, and the October 2017 figure of $561 billion is the highest in history. The growth in margin debt is also increasing even faster than the red hot American stock market. Take a look at the chart below. In previous years, growth in margin debt remained lower than S&P500 growth. But since the last recession, that trend has since reversed and margin debt is threatening to spiral out of control. 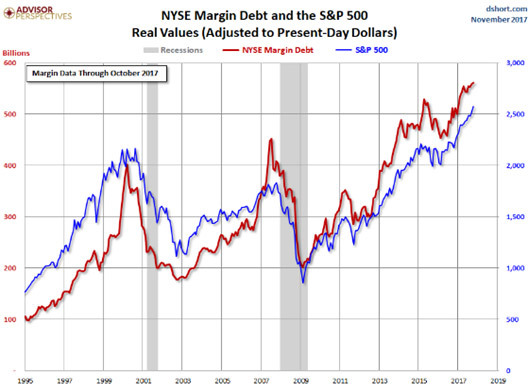 What’s even more worrying is that margin debt isn’t the only thing that’s pumping leverage into the stock market. It’s just the most measurable metric. Securities-based loans, in which loans are provided with securities as collateral aren’t tracked by the SEC or FINRA. There is growing concern about just how much this ‘shadow margin’ is adding to the overall leverage. Translation: If a sell off is triggered, the insane levels of margin debt on the market could turn that sell off into a bloodletting. Unusually low volatility. The market has been up, up, and up. It’s now been a year without a 3 percent or more correction in the US market. How long can this last? Could the stock market be a giant leverage driven ticking time bomb? Or will we look back at this period as a time of unprecedented corporate prosperity? Intelligent investors aren’t waiting to find out. They are hedging their bets by diversifying their portfolios into long term stores of value, namely precious metals. These are investments that have proven time and time again to be one of the best ways to hedge against the economy as a whole. And in this environment, it might be your safest bet.